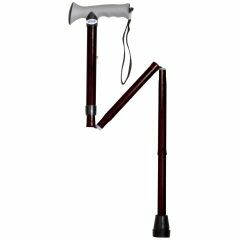 Height adjusts from 33" to 37"
Aluminum Folding Canes with Gel Grip by Drive Medical is available in a few designer colors and designs. They feature a comfortable gel grip that reduces hand stress and fatigue. These canes can be adjusted from 33" to 37" in height and break down into 4 small sections for easy storage in a car, under a bed, or on a shelf. These canes are only 1" in diameter, yet can support up to 300 pounds in weight without breaking or cracking. This product is also backed by Drive Medical's Limited Lifetime Warranty. Nice product that I would recommend. Lightweight cane good for someone that is not steady on their feet. collapses easily. fits in purse or carry on. like the handle. purchased a second one for use by another household member, could not find locally. Easy to fold and feels sturdy. Where can I get replacement tips for my folding cane. The ones I have been finding are much smaller at the base. I want to replace my cane tip with the same one that it came with. Can you help?